Another president's son caught with his hand in the cookie jar? This is probably the last thing Guinea’s President Alpha Condé needed smack in the middle of a very heated election campaign. In mid September, as the acrimony between Condé and his opponents peaked in the run-up to yesterday’s presidential elections, French newspapers revealed details of charges made against Condé’s son, Mohamed Alpha Condé, in France. He is accused of living it up in Paris and spending ill-gotten gains, dished out by French companies who do business in Guinea. Guineans voted yesterday in the elections that saw sporadic violence break out across the country. Conde was up against his arch rivals Celou Dalein Diallo and Sidya Touré in a tight race. In the past few months, the opposition accused the incumbent of trying to manipulate the voters’ roll. It also alleged that the electoral commission cannot be independent given that it’s headed by one of Condé’s friends; and they also said that voters’ cards weren’t distributed evenly. 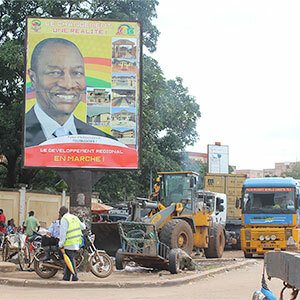 In the early years of his presidency, following the December 2010 elections, the opposition accused Condé of irregularities in favouring French companies for business deals in Guinea. The charges against Mohamed Condé include benefiting from the largesse of those companies involved. Predictably, Condé sees the accusations against his son as a political plot against him. He told the pan-African weekly Jeune Afrique in an interview last week that the charges ‘by an unknown NGO’ were both vague and defamatory. ‘What I notice, though, is the link between these charges and the proximity of the presidential election,’ he said. The NGO that laid the complaint is a little-known organisation called the Foundation for Democracy and Governance, based in Brussels. Its director, Gregory Matthieu, is a former European Council official and has been a fierce critic of President Condé for a number of years now. He accused the Guinean president of cheating in the 2010 elections, notably by using a South African company to organise the polls that allegedly favoured Condé. This is the same accusation made by the opposition and local media in Guinea at the time. Matthieu also noted in an interview in 2013 that Condé’s son was the presidential advisor when it came to mining contracts. He denies, however, that his gripe with Condé is personal. This is not the first African president’s son to be accused of siphoning off funds to finance their expensive lifestyles abroad. Last year, Teodorín Nguema Obiang Mangue – the son of President Teodoro Obiang Nguema of Equatorial Guinea – was indicted by a French court for money laundering and fraud involving public funds. Teodorín is known for his flamboyant lifestyle and frequent visits via private jets to places like Rio and Miami, where he stays in luxury hotels. The investigation also saw a number of luxury cars seized at an apartment belonging to the Obiang Nguemas in a posh area of Paris. The president’s son is not only one of the country’s deputy presidents, but also in charge of the army and state security in Equatorial Guinea. The indictment against Teodorín Nguema Obiang is part of a wider investigation against African elites who spend their money in France, known as the bien mal acquis (ill-gotten gains) investigation. The investigation was launched in 2008, following a complaint by Transparency International. Nguema senior, the Republic of Congo’s President Denis Sassou Nguesso and the late Omar Bongo were also on the list of those being investigated. However, there are so many vested interests in such a case that none of the serving presidents have yet been indicted. It is also infinitely difficult to prove that the money spent is, in fact, public funds that should rather go to uplifting poverty-stricken citizens in their countries. These legal processes, even if they are still at the investigations level, do spell danger for heads of state like Condé and Obiang Nguema. Sooner or later the escapades of their sons could catch up with them, as it did with former Senegalese President Abdoulaye Wade. His son, Karim, is currently behind bars in Senegal after being found guilty of several accounts of fraud amounting to millions of euros. Karim was given an all-powerful ministry when his father was still in power between 2000 and 2012. At the time, it was said that to conduct any business in Senegal, you first had to deal with the president’s son, dubbed ‘mister 15%’. When the row started over Wade’s attempt to secure a third term, one of the main causes for public dissatisfaction was the suspicion that he wanted to give over power to Karim. Wade was duly defeated at the polls in an election widely considered to be free and fair. Karim was sent to jail for six years in March 2015 by a special anti-corruption court. He was also given a fine of €209 million. The anti-corruption court reportedly found proof of cash stashed offshore by Karim Wade thanks to big infrastructure and energy deals. If the accusations against Mohamed Condé are true, it could in the long run be to the detriment of his father’s career. Clearly, the behaviour of Karim Wade was damaging to his father’s reputation as Senegalese head of state. When Wade tried to muster enough support for a third term in 2012, the accusations of nepotism were one of the issues that led to his defeat at the polls against President Macky Sall. President Condé already has enough on his plate to stay in power in a very volatile political situation. He should probably rein in his son before it is too late.